The wait is over – Peach Kelli Pop's second LP is here! I'm a sucker for music that's reminiscent of the past so I swooned over Peach Kelli Pop aka White Wires drummer Allie Hanlon's "Do The Eggroll," amongst other tracks on her 2010 self-titled LP. Apparently I'm not the only one, this album was a big hit, so much that Joe from Germ Attak re-recorded the album under the name "Peach Kelli Punk" (which I also own and occasionally enjoy) and even more noteworthy – the awesome Burger Records took Ottawa-bred Hanlon on board and distributed her first LP on tape. We've waited a long time for another PKP full-length and to our delight, Hanlon's sophomore release delivers. With the same poppy hooks and throwbacks, this 2013 LP seems like a playful continuation of the first with a few minor exceptions. The songs on the second album feel faster, include more distortion, and experiment with the occasional sample. The audio samples that are interweaved within tracks like "Society of the Enoch" and "Tucson Song" help to add dimension and a nostalgic feel while being subtle enough not to distract listeners. But also as per usual, Hanlon remains sugary sweet in the same way we appreciated her a few years back with simple and catchy songs about love and loss like "Original Sin" and "True Blue." Each track is short 'n punchy, full of fun, and saturated with sassy vibes. It might be a far out claim to make but I think the album artwork of both releases can reveal a lot about their sound. PKP's first LP had a bubblegum pink cover and oozed with cuteness, where the second LP sports a bright red cover and while still cute, has a little more fire. Third track "Scorpio" is a good representation of this – it's heavy and kind-of erratic (fitting if you think of the personality traits of a true scorpio) – and proves that PKP isn't all cute and games. The same can be said about energetic track "Society of Enoch" which samples talk of space exploration and sounds futuristic at points. In fact, Hanlon seems pretty keen on using computerized noises – dreamy, acoustic track "Tucson Song" incorporates gameboy bloops and beeps that successfully melt my heart. Along with videogame effects in the last track, a metallophone (or something like it) is prevalent throughout the album, as we might've expected after previewing "Panchito Blues ii" and "Dreamphone" a few months back. 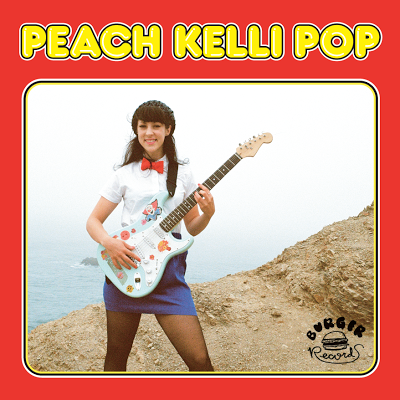 Click here to purchase Peach Kelli Pop's new album via Burger Records.